quarrygirl.com » Blog Archive » LA’s best vegan burger only $9.95 for a short time! 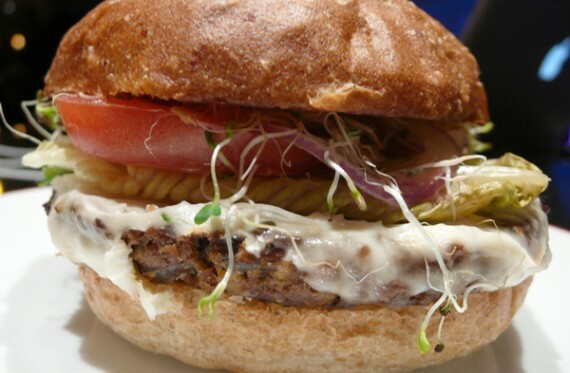 LA’s best vegan burger only $9.95 for a short time! i think a lot of people would agree with me when i say that m cafe’s big macro is the best vegan burger in los angeles. it’s big, it’s hearty, it has a homemade patty made of rice and vegetables, and it’s covered in melted cheese and creamy sauce. the big macro comes with a side salad of your choice (i suggest the spicy kale) and usually sells for $11.45. well until november 9th, m cafe is offering a special deal on their popular burger, and selling it for just $9.95! the best vegan burger in LA and a hefty side salad for under ten bucks?! yes please! in addition to the discounted burger, m cafe is also offering their most popular salad for $9.95 until november 9th. 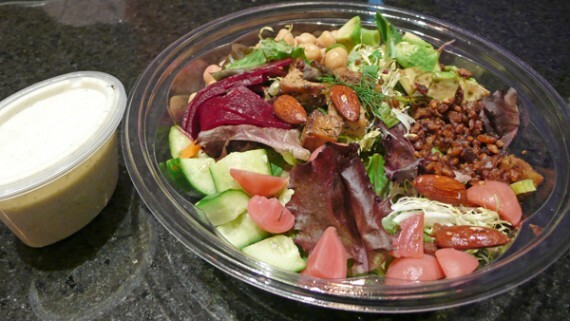 the m chopped is massive and comes filled with fresh vegetables, tender leaves, tempeh bacon, and herb-baked tofu. damn, it’s so good. so, that’s all. i suggest you get over to m cafe and take advantage of these discounts. and if you haven’t tried the big macro yet, you know nothing about vegan burgers. nothing! Sorry, can’t agree that it’s the best vegan burger. :-/ Sadly, most places, even if they have vegan burgers, don’t have vegan buns. I have to double check on Lucky Devil’s because they for sure have the best veggie burger I have ever eaten. maybe the best veggie burger in LA, but mary’s has the best burger in socal! but the one in the picture above looks way look delectable than any of the burgers i’ve had at M.
I’m with Britt. M Cafe’s lunch items have never been STELLAR as far as I’m concerned. Have you had the burger at Veggie Grill? I’ll be at the new location next weekend, so maybe I’ll get to check that out and report back. that burger looks extra awesome! I think M Cafe has the best veggie burger not just in LA, but anywhere. It slaughters Madeleine Bistro and other places. The Big Macro is amazing. to be honest, the Big Macro is the best consistently good vegan burger in LA. Veggie Grill tries, but their stuff is, I find, dry compared to the moist, scrumptious Big Macro. For $9.95 including a side (choose one at random, they’re all amazing) you can’t go wrong. M cafe is a special place, and this burger is gorgeous. Oh my gosh, I need to get myself out to LA!! i CAN not believe what im reading! the big maque at madeleines bistro is an orgasmic experience. m cafe is amazing, but- let’s just say, i have never had any food orgasms there. I prefer the BBQ carolina seitan at M.
You mention spicy kale? Is this new? You mean the peanut kale? @potionlords: doh! yeah, i meant the peanut kale. it’s kinda spice, eh?